SHENZHEN Bay, one of the most important stopovers for black-faced spoonbills, recorded more than 30 percent of the bird’s global population, which shows that the wetlands in the bay area have become one of their favorite winter habitats, according to the latest figures from the Hong Kong Bird Watching Society. The number of black-faced spoonbills worldwide has increased to 4,463, up 13 percent from last year and setting a new record, according to a global census organized by the Hong Kong Bird Watching Society this year, the Shenzhen Economic Daily reported. The census has been conducted annually to assess the wintering abundance and distribution of the globally endangered bird since 1994, and statistics show that the number of black-faced spoonbills has increased gradually over the years. Yu Yat-tung, research manager of Hong Kong Bird Watching Society, predicts that black-faced spoonbills have a chance to be re-categorized as “vulnerable” from “endangered” at the International Union for Conservation of Nature’s Red List of Threatened Species, which may be a positive example rarely seen in the history of bird conservation in Asia. “However, we cannot ignore the different threats to their habitats,” Yu was quoted as saying. Looking at the data over the past five years, Yu believes that the bird’s overall population has increased, as the number of black-faced spoonbills recorded in Japan, South Korea, China’s Taiwan, Shenzhen Bay and other regions has grown significantly. 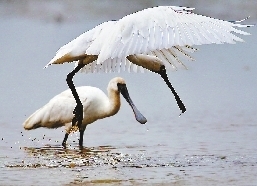 Yu said the number of black-faced spoonbills recorded in Jiangmen City, Guangdong, rose from 23 in 2015 to 61 in 2019, and from four on Leizhou Peninsula in 2014 to 14 this year, which indicates that the winter habitat of the bird may be expanding. As the number of black-faced spoonbills is expected to rise steadily, the conservation of the bird will gradually focus on increasing the capacity of the bird’s wintering grounds and expanding its winter habitat, and the former may be applicable in Hong Kong and Shenzhen Bay, according to Yu.